Wow! We knew that shipping containers could be used to build beautiful buildings, but this art studio by MB Architecture in Amagansett, New York is truly gorgeous. The artist had a limited budget of $60,000 to work with and wanted something close to home that was both functional as a working space, but would also be inviting and reflective. 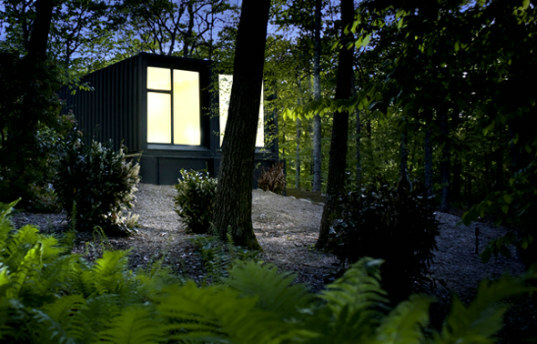 The exterior is kept very simply as the shipping container, but painted gray for a sophisticated look and a way to blend the container into the wooded environment. Inside, bright white walls act as a blank canvas for new artwork and ample daylighting streams in through the large windows on either end. The foundation for the studio is built into the earth with 9′ walls and acts as the lower level and work space for the studio. Two 40′ (9’6″) high cube shipping containers were then set on top of the foundation to create a two-story double wide structure. About 75% of the floors of the containers were cut away to create the tall ceilings with lots of natural light flooding in from the high windows. Next to the painting area on the lower floor is a large storage area and directly above on the top floor is another work area. 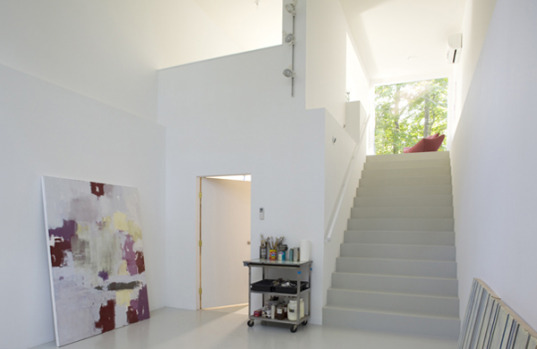 The container wide staircase acts as a transitional and gallery space for artwork. Each of the two containers cost about $2,500 delivered. An amazing example of how beautiful shipping container architecture can be. Standard shipping container is about 320 square feet (8' x 40'). There are also 20' units, which would be about 160 sq ft. I'd love to have a studio constructed out of a shipping container, only would prefer to have it without stairs, and one floor; perhaps w/a loft over part of it. I wonder how many square feet a shipping container is (length and width). Nice. But, typical artist pompous. Give me two containers and I will top that + more.